When you feel drowning in content but still want to stay updated, then visit www.timelypick.com. 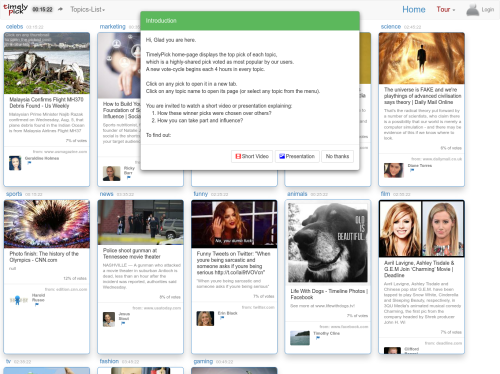 On Timelypick you will find the current 20 most popular posts from around the web, organized by topic. The picks are updated every 4 hours, and curated by automatic software, expert human curators and by the visitors. Timelypick saves your time by staying updated with a quick view, since each pick has a thumbnail and a short description. Those who want to have fun, while being updated, can guess which 3 picks are most voted by the others, and after voting for 3 picks, you'll find out how close your votes are with the current results. Each topic has 4 hour voting cycle. During these 4 hours the users suggest popular content from around the web and vote for picks. At the end of a vote cycle the most voted picks are displayed for the next 4 hours on the topic page.